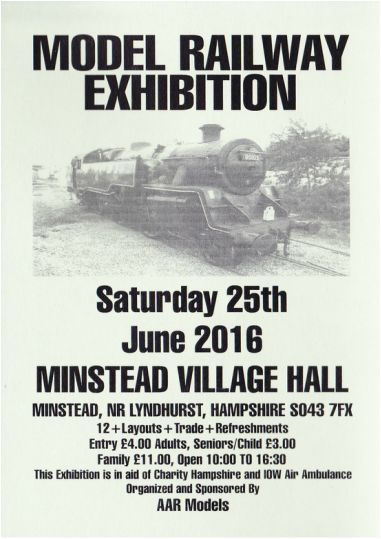 AAR Models organise the Minstead Model Railway Exhibition which has been held in Minstead Village Hall since 2010. Minstead is situated in the New Forest just south of junction 1 on the M27. The eigth exhibition was held on Saturday 25th June 2016. Car parking is free and non-drivers may like to take advantage of the bar which will be open between 12:00 & 15:00. The venue is wheelchair friendly, apart from access to the refreshment area and stage. However, stewards will be on hand to offer assistance if required. Click here to see some pictures from the 2016 exhibition held on 25th June. O gauge 1930's GWR branch line terminus. HO9 narrow gauge railway set in a Belgium town. HO An American lakeside switching layout where a railroad ferry is loaded and unloaded. OO gauge Thomas layout that children can drive a train for a small donation to Hampshire and I.O.W Air Ambulance. N gauge third-rail electric layout set in south London around 1967. A layout using fourth generation Lego trains. N gauge layout based on the Longmoor Military Railway. OO9 narrow gauge based on the Lynton and Barnstable Railway. OO gauge 1980's diesel depot somewhere in Scotland. OO gauge Isle of Wight layout. ​OO gauge modern image layout set somewhere in the south. ​OO gauge British Railways Southern Region branch line terminus. OO gauge Inglenook sidings shunting layout. ​Demonstration of 3mm kit construction. 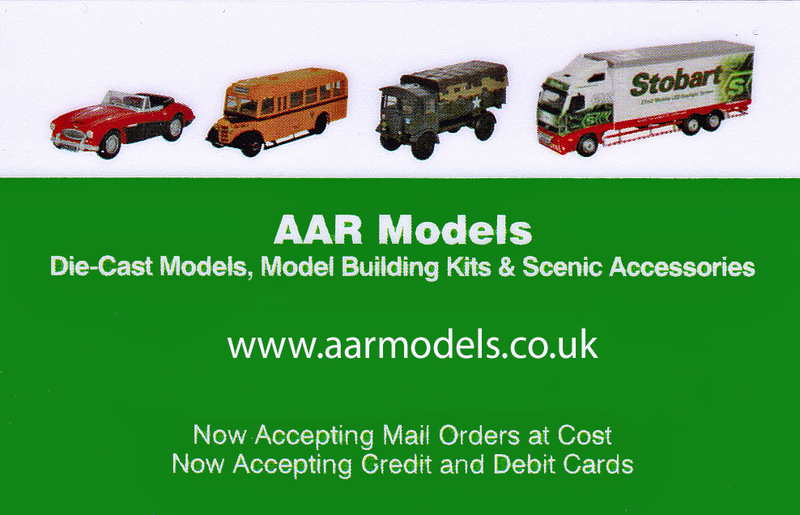 Diecast model vehicles, plastic kits, railway stock and scenic material in N to O gauge. All sorts of transport books..
A very good book stand with the proceeds going to the Scleroderma Society. An excellent selection of second hand OO railway models. ​Phil's transfers can be used for any model road transport vehicles. A selection of nearly new and second hand models and accessories. ​A project to restore bus number 15.